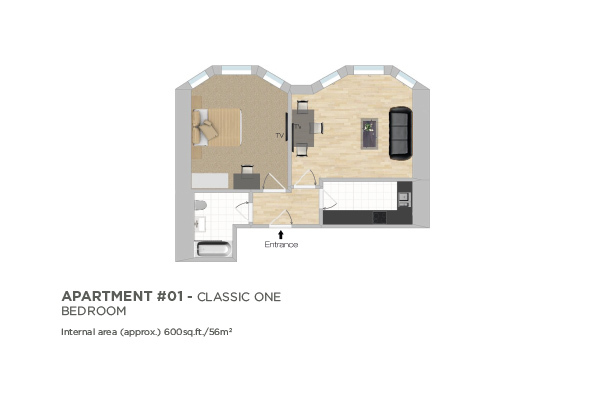 1 Harrington Gardens’ large one bedroom apartments are approximately 55 square metres, with a super king size bed and separate large living room. Enjoy your London stay in a greater space than any hotel room can offer, with the added facilities of a separate lounge, well-equipped kitchen and much more. This is a spacious, air-conditioned residence, furnished in a contemporary style and located in chic central London, close to many shops and restaurants. The apartment can accommodate an extra guest with the addition of a single rollaway bed for a supplementary cost of £30 per night.